vibration of first-order shear deformation plates using Ritz method. The dispersion relations for the GNSG plate model is also derived. Several numerical examples are studied to show the efficiency, competence and accuracy of the proposed model. To ensure the applicability of the presented GNSG plate model, the results are compared with the experimental data available in the scientific literature. It is found that the effects of scale parameters on the wave frequencies are significant at high wavenumbers and ratio of any pair of these parameters is the main criterion for the correct study of size effects. The results show that the reduced nonlocal strain-gradient (RNSG) model and the GNSG model diverge in higher vibration modes. A general nonlocal plate model is developed via nonlocal strain gradient theory. Natural frequencies of the nanoplate are calculated using a Ritz procedure. Three material length scales are used in the model to capture the size effects. Rise and fall in the nanoplate stiffness may happen duo to the length scales. The applicability of the present model is tested by experimental data. J.A. Ruud, T.R. Jervis, F. Spaepen, Nanoindentation of Ag/Ni multilayered thin films, Journal of Applied Physics, 75 (1994) 4969-4974. P. Ball, Roll up for the revolution, Nature, 414 (2001) 142-144. R.H. Baughman, A.A. Zakhidov, W.A. De Heer, Carbon nanotubes--the route toward applications, science, 297 (2002) 787-792. B.H. Bodily, C.T. Sun, Structural and equivalent continuum properties of single-walled carbon nanotubes, International Journal of Materials and Product Technology, 18 (2003) 381-397. C. Li, T.W. Chou, A structural mechanics approach for the analysis of carbon nanotubes, International Journal of Solids and Structures, 40 (2003) 2487-2499. R. Liu, L. Wang, Thermal vibration of a single-walled carbon nanotube predicted by semiquantum molecular dynamics, Physical Chemistry Chemical Physics, 17 (2015) 5194-5201. G. Shi, P. Zhao, A new molecular structural mechanics model for the flexural analysis of monolayer graphene, Computer Modeling in Engineering & Sciences(CMES), 71 (2011) 67-92. P.L. De Andres, F. Guinea, M.I. Katsnelson, Density functional theory analysis of flexural modes, elastic constants, and corrugations in strained graphene, Physical Review B, 86 (2012) 245409. A.C. Eringen, Nonlocal polar elastic continua, International journal of engineering science, 10 (1972) 1-16. A.C. Eringen, On differential equations of nonlocal elasticity and solutions of screw dislocation and surface waves, Journal of applied physics, 54 (1983) 4703-4710. A.C. Eringen, Nonlocal continuum field theories, Springer Science & Business Media, 2002. W.H. Duan, C.M. Wang, Y.Y. Zhang, Calibration of nonlocal scaling effect parameter for free vibration of carbon nanotubes by molecular dynamics, Journal of applied physics, 101 (2007) 024305. Q. Wang, Q.K. Han, B.C. Wen, Estimate of material property of carbon nanotubes via nonlocal elasticity, Advanced Theoretical Applied Mechanics, 1 (2008) 1-10. L.Y. Huang, Q. Han, Y.J. Liang, Calibration of nonlocal scale effect parameter for bending single-layered graphene sheet under molecular dynamics, Nano, 7 (2012) 1250033. Y. Liang, Q. Han, Prediction of nonlocal scale parameter for carbon nanotubes, Science China Physics, Mechanics and Astronomy, 55 (2012) 1670-1678. A.A. Pisano, A. Sofi, P. Fuschi, Nonlocal integral elasticity: 2D finite element based solutions, International Journal of Solids and Structures, 46 (2009) 3836-3849. W.H. Duan, C.M. Wang, Exact solutions for axisymmetric bending of micro/nanoscale circular plates based on nonlocal plate theory, Nanotechnology, 18 (2007) 385704. P. Lu, P.Q. Zhang, H.P. Lee, C.M. Wang, J.N. Reddy, Non-local elastic plate theories, in: Proceedings of the royal society of london a: Mathematical, physical and engineering sciences, The Royal Society, 2007, pp. 3225-3240. R. Aghababaei, J.N. Reddy, Nonlocal third-order shear deformation plate theory with application to bending and vibration of plates, Journal of Sound and Vibration, 326 (2009) 277-289. H.T. Thai, A nonlocal beam theory for bending, buckling, and vibration of nanobeams, International Journal of Engineering Science, 52 (2012) 56-64. T. Murmu, S.C. Pradhan, Small-scale effect on the free in-plane vibration of nanoplates by nonlocal continuum model, Physica E: Low-dimensional Systems and Nanostructures, 41 (2009) 1628-1633. S. Faroughi, S.M.H. 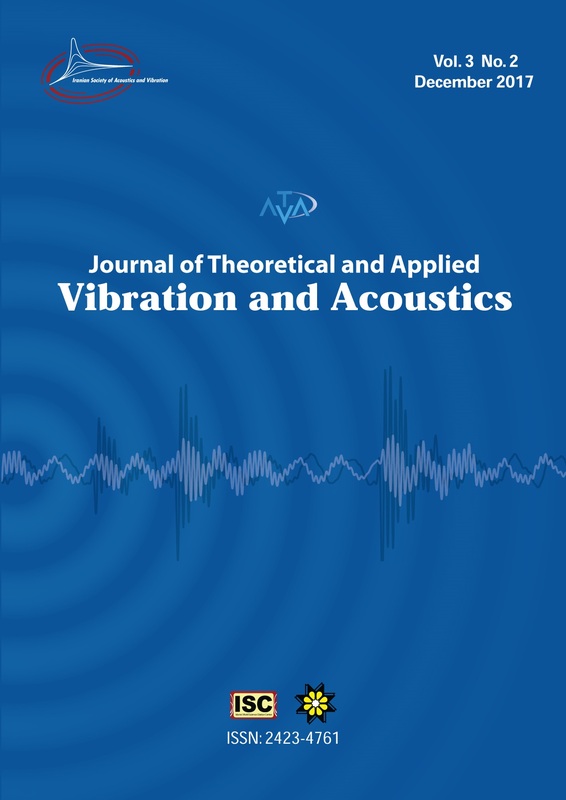 Goushegir, Free in-plane vibration of heterogeneous nanoplates using Ritz method, Journal of Theoretical and Applied Vibration and Acoustics, 2 (2016) 1-20. Y.Z. Wang, F.M. Li, K. Kishimoto, Flexural wave propagation in double-layered nanoplates with small scale effects, Journal of Applied Physics, 108 (2010) 064519. L. Wang, H. Hu, Flexural wave propagation in single-walled carbon nanotubes, Physical Review B, 71 (2005) 195412. B.o. Wang, Z. Deng, H. Ouyang, J. Zhou, Wave propagation analysis in nonlinear curved single-walled carbon nanotubes based on nonlocal elasticity theory, Physica E: Low-dimensional Systems and Nanostructures, 66 (2015) 283-292. M.A. Eltaher, M.A. Hamed, A.M. Sadoun, A. Mansour, Mechanical analysis of higher order gradient nanobeams, Applied Mathematics and Computation, 229 (2014) 260-272. C.W. Lim, G. Zhang, J.N. Reddy, A higher-order nonlocal elasticity and strain gradient theory and its applications in wave propagation, Journal of the Mechanics and Physics of Solids, 78 (2015) 298-313. H.M. Ma, X.L. Gao, J.N. Reddy, A microstructure-dependent Timoshenko beam model based on a modified couple stress theory, Journal of the Mechanics and Physics of Solids, 56 (2008) 3379-3391. N. Challamel, C.M. Wang, The small length scale effect for a non-local cantilever beam: a paradox solved, Nanotechnology, 19 (2008) 345703. N. Challamel, Z. Zhang, C.M. Wang, J.N. Reddy, Q. Wang, T. Michelitsch, B. Collet, On nonconservativeness of Eringen’s nonlocal elasticity in beam mechanics: correction from a discrete-based approach, Archive of Applied Mechanics, 84 (2014) 1275-1292. C.M. Wang, S. Kitipornchai, C.W. Lim, M. Eisenberger, Beam bending solutions based on nonlocal Timoshenko beam theory, Journal of Engineering Mechanics, 134 (2008) 475-481. D.C.C. Lam, F. Yang, A.C.M. Chong, J. Wang, P. Tong, Experiments and theory in strain gradient elasticity, Journal of the Mechanics and Physics of Solids, 51 (2003) 1477-1508. E.C. Aifantis, On the role of gradients in the localization of deformation and fracture, International Journal of Engineering Science, 30 (1992) 1279-1299. F.A.C.M. Yang, A.C.M. Chong, D.C.C. Lam, P. Tong, Couple stress based strain gradient theory for elasticity, International Journal of Solids and Structures, 39 (2002) 2731-2743. J.N. Reddy, Microstructure-dependent couple stress theories of functionally graded beams, Journal of the Mechanics and Physics of Solids, 59 (2011) 2382-2399. H. Askes, E.C. Aifantis, Gradient elasticity and flexural wave dispersion in carbon nanotubes, Physical Review B, 80 (2009) 195412. B. Akgöz, Ö. Civalek, Application of strain gradient elasticity theory for buckling analysis of protein microtubules, Current Applied Physics, 11 (2011) 1133-1138. W. Xu, L. Wang, J. Jiang, Strain gradient finite element analysis on the vibration of double-layered graphene sheets, International Journal of Computational Methods, 13 (2016) 1650011. H.X. Nguyen, T.N. Nguyen, M. Abdel-Wahab, S.P.A. Bordas, H. Nguyen-Xuan, T.P. Vo, A refined quasi-3D isogeometric analysis for functionally graded microplates based on the modified couple stress theory, Computer Methods in Applied Mechanics and Engineering, 313 (2017) 904-940. Y.S. Li, E. Pan, Static bending and free vibration of a functionally graded piezoelectric microplate based on the modified couple-stress theory, International Journal of Engineering Science, 97 (2015) 40-59. L.i. Li, Y. Hu, Wave propagation in fluid-conveying viscoelastic carbon nanotubes based on nonlocal strain gradient theory, Computational materials science, 112 (2016) 282-288. L.i. Li, Y. Hu, L. Ling, Wave propagation in viscoelastic single-walled carbon nanotubes with surface effect under magnetic field based on nonlocal strain gradient theory, Physica E: Low-dimensional Systems and Nanostructures, 75 (2016) 118-124. L.i. Li, Y. Hu, Buckling analysis of size-dependent nonlinear beams based on a nonlocal strain gradient theory, International Journal of Engineering Science, 97 (2015) 84-94. A. Farajpour, M.R.H. Yazdi, A. Rastgoo, M. Mohammadi, A higher-order nonlocal strain gradient plate model for buckling of orthotropic nanoplates in thermal environment, Acta Mechanica, (2016) 1-19. L.i. Li, Y. Hu, L. Ling, Flexural wave propagation in small-scaled functionally graded beams via a nonlocal strain gradient theory, Composite Structures, 133 (2015) 1079-1092. L.i. Li, X. Li, Y. Hu, Free vibration analysis of nonlocal strain gradient beams made of functionally graded material, International Journal of Engineering Science, 102 (2016) 77-92. F. Ebrahimi, M.R. Barati, A. Dabbagh, A nonlocal strain gradient theory for wave propagation analysis in temperature-dependent inhomogeneous nanoplates, International Journal of Engineering Science, 107 (2016) 169-182. S. Faroughi, S.M.H. Goushegir, H.H. Khodaparast, M.I. Friswell, Nonlocal elasticity in plates using novel trial functions, International Journal of Mechanical Sciences, 130 (2017) 221-233. L. Behera, S. Chakraverty, Effect of scaling effect parameters on the vibration characteristics of nanoplates, Journal of Vibration and Control, 22 (2016) 2389-2399. L. Behera, S. Chakraverty, Free vibration of nonhomogeneous Timoshenko nanobeams, Meccanica, 49 (2014) 51-67. S. Chakraverty, L. Behera, Free vibration of rectangular nanoplates using Rayleigh–Ritz method, Physica E: Low-dimensional Systems and Nanostructures, 56 (2014) 357-363. R.D. Mindlin, Micro-structure in linear elasticity, Archive for Rational Mechanics and Analysis, 16 (1964) 51-78. R.D. Mindlin, Second gradient of strain and surface-tension in linear elasticity, International Journal of Solids and Structures, 1 (1965) 417-438. C.M. Wang, J.N. Reddy, K.H. Lee, Shear deformable beams and plates: Relationships with classical solutions, Elsevier, 2000. M.R.K. Ravari, H. Zeighampour, Vibration analysis of functionally graded carbon nanotube-reinforced composite nanoplates using Mindlin’s strain gradient theory, Composite Structures, 134 (2015) 1036-1043. M. Mohr, J. Maultzsch, E. Dobardžić, S. Reich, I. Milošević, M. Damnjanović, A. Bosak, M. Krisch, C. Thomsen, Phonon dispersion of graphite by inelastic x-ray scattering, Physical Review B, 76 (2007) 035439. L.E. Shen, H.S. Shen, C.L. Zhang, Nonlocal plate model for nonlinear vibration of single layer graphene sheets in thermal environments, Computational Materials Science, 48 (2010) 680-685.